Bringing home a newborn baby is the most exciting, fulfilling, and confusing time in a new mother’s life. Should I breastfeed? Disposable or cloth diapers? How does this breast pump work? What in the heck is going on with my body!? No, really! WHAT. IS. GOING. ON. WITH. MY. BODY!? Giving birth is no small feat, sister. In fact, over the course of pregnancy, your uterus stretches from the size of a peach to the size of a watermelon, which is about 500 times its normal size! With all of the changes your body has endured over the past 9 months, it is no surprise that it can take some time for it to get back to normal. Postpartum bleeding, hemorrhoids, and even hair loss are common changes that women experience after pregnancy, and they are completely normal and usually harmless. Postpartum bleeding (lochia) is your body’s way of expelling excess blood, mucus, and placental tissue after giving birth, and it usually begins as a bright red vaginal discharge. Most women (yes, even those who have had a cesarean section) will experience some bleeding after pregnancy that lasts anywhere from 2 to 6 weeks. Who is at risk for postpartum bleeding? When is postpartum bleeding dangerous? Since your blood supply increases by 50% during pregnancy, postpartum bleeding is usually not dangerous. However, if you begin to lose an excessive amount of blood, if bleeding lasts longer than 6 weeks, if you have large blood clots, or if you begin running a fever, seek medical attention immediately. 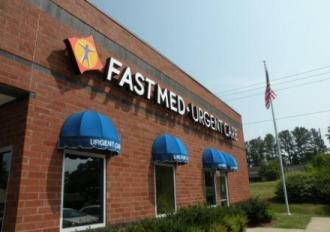 At FastMed, we believe that healthcare should always be affordable, reliable, and available when you need it. Our walk-in clinics are located throughout Arizona and North Carolina all 7 days of the week, 365 days a year–with or without an appointment. The best part? FastMed strives to see every patient in under an hour, so you can spend less time in the waiting room and more time playing patty cake with your sweet bundle of joy.